And that's not its only secret. Marieta Islands National Park is made up of a bunch of small, uninhabited islands in Puerto Vallarta, just off the coast of Nayarit, Mexico. Now a tranquil location for snorkelling, scuba diving and boat tours, the park actually hides two things very well – it’s secret cave beach and it’s turbulent past. From above, this cavity just looks like a hole in the ground. But once you’re inside (after a short swim through a tunnel for access), a stunning beach reveals itself, complete with warm, crystal clear water and a beautiful strip of sand, flanked on all sides by a cave that rises to a halo overhead. Before you go patting Mother Nature on the back for yet another job well done, it’s worth mentioning that this particular wonder is actually man-made – in fact, it’s most likely an accident. The deserted islands were once used as target practice for Mexico’s military in the early 1900s. Large explosions caused cave and rock formations before international outcry in the ’60s led to the islands receiving national park status, with strict conservation in place. Despite this raucous history, the beach bears no scars from this time and all that remains is the peace and quiet to truly enjoy it. 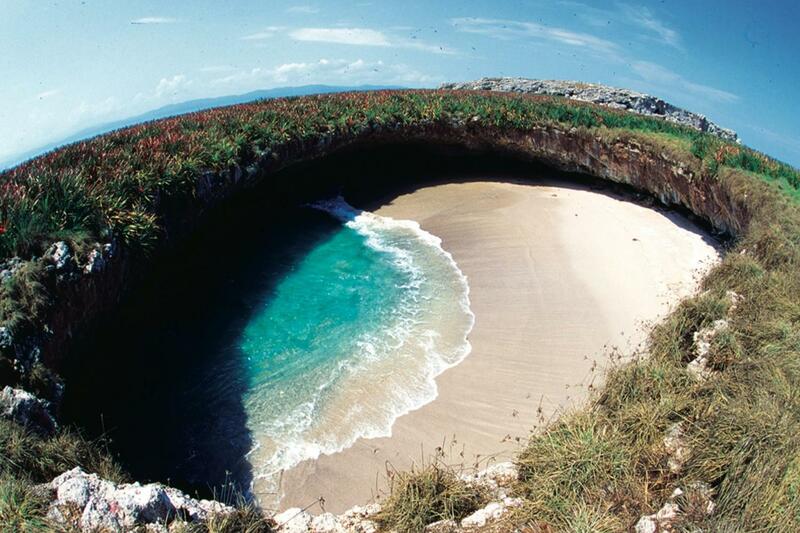 All hoping to visit the hidden beach must have a permit from the Mexican Government, available through Explore Vallarta.